BY THE HORNS: They’re putting the “garden” back into MSG this weekend, packing the ground with 700 tons of dirt as the world’s 40 toughest horn-grabbing daredevils prepare to wrangle 2,000-lb. 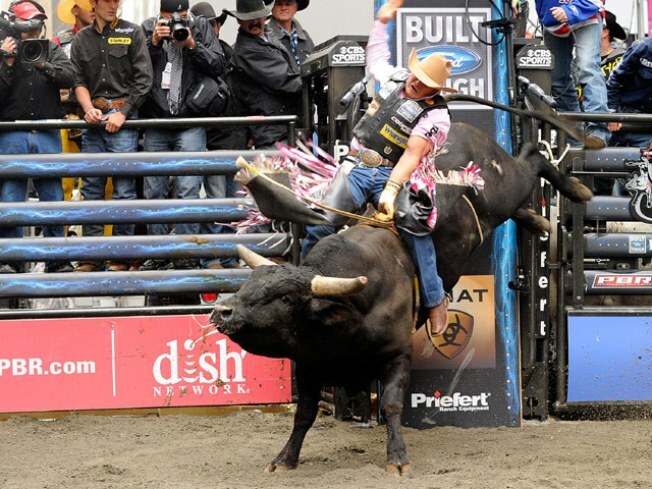 bulls in the 2011 Professional Bull Riders Madison Square Garden Invitational. The three-day event kicks off tonight--so try not to stand directly behind it. 8PM, also on Saturday and Sunday. EAT HERE NOW: New pop-up undergroundish supper club Our Other Location (from one of the founders of the Coach Peaches supper club) calls itself an “unmoored dining room”; it takes over a former school cafeteria in Soho for its dinners tonight and tomorrow. An utterly reasonable $75 (including wine!) gets you a spread prepared by chef Nick Kim (Masa). 8PM, also on Saturday. Get tickets here. STAGED: We know Tony-winner Alan Rickman is a serious thespian and all, but to us, he’ll always be Hans Gruber from Die Hard. Or Robin Hood’s nemesis, the Sheriff of Nottingham, demanding that they “cancel Christmas!” Point is, we’d pay actual dollars to hear him read our own tax return out loud. Tonight, Rickman takes the lead in Henrik Ibsen’s timely tale of a man undone by greed: John Gabriel Borkman is a production from Ireland’s stellar Abbey Theatre getting its US premiere at BAM. 7:30PM; through February 6.